Welcome to GUNFIRE GRAFFITI UK. This is a gun crime research project founded in 2008. It researches, records and reports evidence of roadside gun crime. 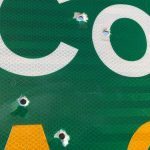 That is the discharge of firearms and shotguns into steel/alloy road sign structures. Whilst these practises are unsurprising in some parts of the world it is perhaps difficult to accept and believe that it is relatively commonplace in the UK. The police and security authorities are largely unaware of it, they don’t have the capacity, knowledge and resources to recognise it. I am not an advocate of conspiracy theories, I base my research on evidence and close technical study. I am always keen to discuss issues. Lack of awareness and “gun savvy”in the UK makes it easy for the perpetrators to illegally experiment and rehearse with all types of firearms. Shootings are often from within the confines of passing vehicles. The UK has strict gun laws but many of these shootings reveal the use of firearms that are banned from legal ownership. The WHAT can be recognised and WHERE is there for all to find and see. The WHEN can be calculated and we can surmise at WHY. The big question is WHO. Could these practises ever have anything to do with the worst possible outcome of gun crime; intimidation, fear, injury and death. If we join up the dots, where does it lead? 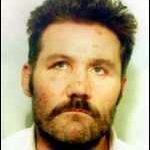 We do know that Michael Ryan who perpetrated the Hungerford Massacre in 1987 went out at night in his car and carried out these type of shootings. He even admitted this to an employer before his rampage and Thames Valley Police found evidence close to Hungerford after his killing spree. The American gangster and gunman Clyde Barrow, (of Bonnie and Clyde fame), did the same in the 1930’s. He would hone his shooting skills on roadside targets in preparation for getaways and ambushes. The recent white supremacist gun terror attack in Christchurch, New Zealand shocked the entire world. As indeed did the Norway bomb and gun attack in July 2011. Few people would have anticipated such firearm terror atrocities in these two nations. Could it happen in the UK? We are officially advised that it is unlikely. 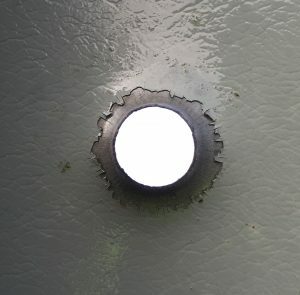 This 20mm shotgun slug penetration near the village of Twycross in Leicestershire was reported to the police who advised local media that it was probably, “Kids with catapults”. The murderer Raoul Moat shot and killed Chris Brown in July 2010 with a 12 bore shotgun using home adapted ammunition – 18mm lead fishing weights. Examples of this type of experimentation with shotguns is very commonplace. To date a total of 582 sites have been found in the UK and Northern Ireland. LATEST DISCOVERIES – (dates found not date occurred). o4 February 2019 – The following sites were found whilst investigating the White House Farm shooting murders which took place in Essex in August 1985. Jeremy Bamber was convicted for the killings. I did not expect to find any locations in the vicinity and whilst there is no connection to the past I found it particularly disturbing. Shotgun pattern blast at the end of Prentice Hall Lane off the B1023. This is near the village of Tollesbury. 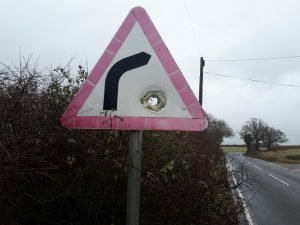 Bullet penetrations x 2 through a bend warning sign on Back Road; this is a minor route between the villages of Tollesbury and Tolleshunt D’Arcy. Shotgun blast penetration through a warning sign. This is directly opposite a property on the B1026 just 1 mile NE out of the village of Goldhanger. 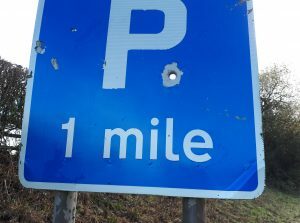 Shotgun pattern blast on a warning sign on the B1026 between Goldhanger and the Osea Leisure Park entrance. Shotgun blast penetration through a bend chevron structure on the B1026 within 100 metres of the above. My first book, GUNFIRE GRAFFITI – Overlooked Gun Crime in the UK was published by Waterside Press in 2012. 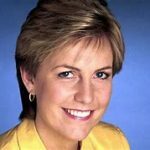 The preface was written by Nick Ross of BBC “Crimewatch” fame. This publication finally came about as a result of the ballistic research carried out in Oxfordshire by Cranfield University. It reveals some startling facts and disturbing examples of ignorance, lack of official knowledge and understanding. My next book plan is BULLET PATH a close study of a selection of gun slay murders, gun terror attacks and assassinations that have occurred around the world. Please look at my BLOG section which sets the scene. Understanding the technical functions of firearms is absolutely vital. 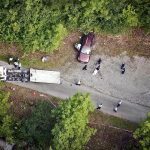 There are interesting factors that link gun incidents and murders, much of which is lost to casual researchers and sometimes to official investigators. If we are going to discuss, report and write articles and books on the subject, it must be accurate. 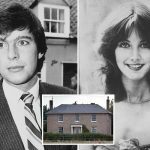 You will find investigation details on The White House Farm Murders – Jeremy Bamber 1985, The Hungerford Massacre 1987, Albert Dryden 1991, Jill Dando 1999, and The Annecy Murders 2012. Also included is the strange case of Manual Wallner in Wales in 2015.